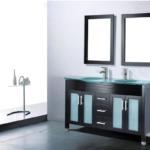 There are many styles of bathroom cabinets. It is important to find the best design for your style of life and decor. Depending on the style and ergonomics of the furniture, you can choose between designer bathroom furniture, modern and contemporary bathroom furniture or inexpensive bathroom furniture, most of which is classic in shape and made with entry-level materials and finishes – quality and thickness of material, assemblies and accessories.